Welcome to Best Roofing’s Education Center. This is where you can empower yourself to make the best roofing decisions you can. While roofing may not be rocket science, it is more complex than most people think it is. Only when people get involved with roofing do they start to understand the complexity and look for someone to get the knowledge from. With that in mind, we have developed a series of Free educational classes and seminars that we offer at our corporate headquarters throughout the year. We have put together various classes that are tailored to property managers, building owners, and facility maintenance personnel to assist them with everything from setting up a maintenance program, to the types of roofing systems available, to costs and budgets. Through our engaging multi-media format, we make it easy for property managers to pick up your required CEU credits. Our seminars can be brought to your office and presented to groups of your managers at special events, or as part of your regularly scheduled management meetings. We offer many different delivery options to fit your needs. The bottom line is we’ll make it work. Gregg Wallick is an approved provider of CEU credits for licensed CAM's in the State of Florida. These classes count towards credit in the "building operations" category as well as "misc.."
Commercial Roofing 101 is a demonstrative class focusing on the principles of roofing and their relationship to property management. We discuss different roofing systems; advantages, materials and various concerns regarding roofing; and common problems associated with roof failures and how to identify them. Through this course you will gain a basic understanding of insurance vs. warranties and what they mean should a catastrophic weather event occur. You will also learn how to prepare your building in order to prevent the extensive damage that water intrusion can cause to your property. Additional discussions will include actual case studies that describe the building issues that hurricanes have caused. Gregg Wallick, President and Chief Executive Officer of Best Roofing and is a state-certified provider of CMA credits.. Gregg has more than 30 years experience and is considered the “go to” guy in roofing. 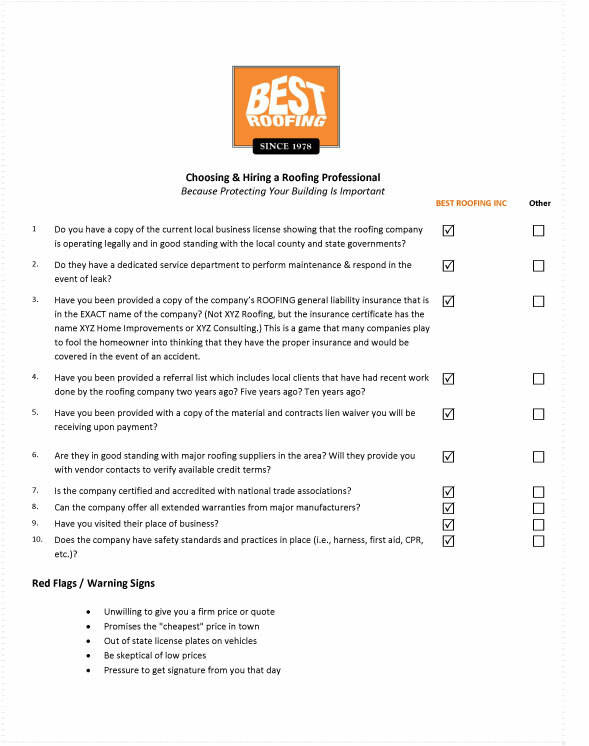 Below is our Checklist on Choosing and Hiring a Roofing Contractor that you should review before engaging your roofing services provider. Take the time to read it and make sure you ask the questions. To find out when our next classes are being held or to schedule a class at your association/company, please contact info@bestroofing.net.